The National Geographic Channel is boldly going where it's never gone before: into late-night TV. Author, astrophysicist, Cosmos host and Cannes presenter Dr. Neil deGrasse Tyson will host Star Talk, the network's first late-night series, debuting in April. Based on Tyson's popular podcast and radio show, Star Talk "will bridge the intersection between pop culture and science as it brings together celebrities, comedians and scientists to discuss the latest developments in our vast universe," said Courteney Monroe, CEO of National Geographic Channels. The new program, announced at the Television Critics Association winter press tour, adds to Tyson's lengthy list of TV credentials, including PBS' Nova, Fox's hit revival of Carl Sagan's Cosmos, a six-part lecture series available on Netflix called The Impossible Universe and many appearances on popular talk shows like The Daily Show. Star Talk will be less like his intricately edited and computer-enhanced work on Nova and Cosmos, instead capturing more of the conversational tone from his chats with Jon Stewart and Stephen Colbert. 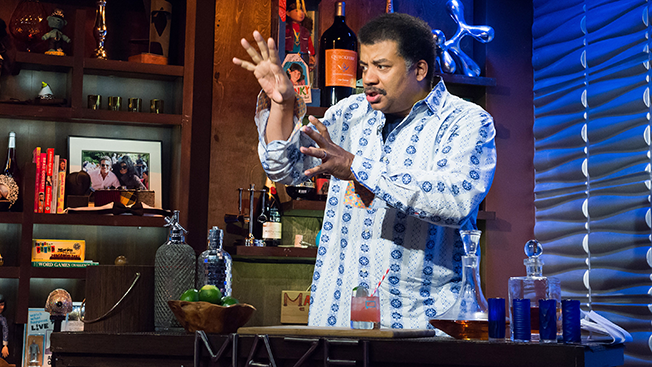 "It's a very different way of bringing science to the public," said Tyson, who will host the series from the site of his day job: the American Museum of Natural History's Hayden Planetarium in New York. "Are people ready for it? We don't know, but we have enough things going for it that I think it's surely worthy of this foray." National Geographic Channel also announced it will be "returning to our roots" by resurrecting Explorer, the longest-running documentary series in U.S. history (totaling 25 years and more than 2,000 films), this summer.